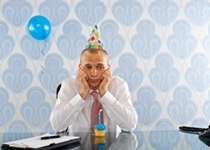 Home » Brain Function » Depression » Do Milestone Birthdays Cause Depression? Birthdays are always a great celebration. Today, March 31, I turn the big 3-0. But I’m not sure what all the fuss is about. After all, I feel the same I did when I was 29. Why do many people seem to make a big deal about any milestone birthday? Why do milestone birthdays cause depression for many? Leading up to the big day, I seem to hear things like, “It’s all downhill from here.” What do they mean by that? Some people may compare a milestone birthday to skiing down a mountain, but I feel like I’m climbing that mountain. I live by the mantra that age is only a number. However, others don’t embrace milestone birthdays with such optimism. This is what I call a rollercoaster birthday. One minute, they are having a great time; the next, they are in tears. They are getting headaches and backaches throughout the day, and they just don’t seem to be enjoying their birthday at all. Overall, they are sad, depressed, and wish they had accomplished more in life. Simply put, they have the birthday blues. It is important to stay positive about your age. Why? Growing older doesn’t cause depression, but depression may cause you to get older. In a study published in the journal Molecular Psychiatry, researchers suggested that cells in the body aged faster when the participant had depression. The study observed the cell structure telomeres in more than 2,400 people either diagnosed with or without depression. It included 1,095 major depressive disorder (MDD) patients, 802 former MDD patients, and 520 participants without depression. The researchers found that an average of 83 to 84 DNA base pairs were significantly shorter in people who suffered from depression. The researchers could not prove why depression can lead to shorter telomeres. Telomeres are a cellular indicator for getting older. They cap chromosome ends for cell DNA protection. In cell division, they get a little shorter, and when they are too short, they cannot divide. Scientists have linked short telomeres with signs of aging like poor immunity and wrinkled skin. People with depression are also at greater risk of type 2 diabetes, heart disease, cancer, and dementia. How to Avoid Depression on Your Birthday? I plan to thoroughly enjoy my 30th birthday with family and friends. Sharing laughs and just being around people who appreciate you and care about you can help put a smile on your face. Plus, laughter is linked to reduced depression, anxiety, and stress. If it is warm, have an outdoor party and further reduce depression with some healthy vitamin D from the sunlight. Quite often, people eat whatever they want during birthday celebrations. Birthday parties often include pizza and a birthday cake with frosting and sprinkles. What’s ironic is that those foods contain ingredients that can trigger depression, including gluten, wheat, and dairy. Depression is also linked with hormone imbalances, whereas nutrient-rich meals can help balance your adrenal and thyroid glands. I’m celebrating my birthday with a potluck, suggesting people bring healthy dishes. After all, I know I can’t force healthy eating on others. People put ridiculous expectations on themselves for milestone birthdays. These include expectations like by 30, they want to be CEO of their company, or the president of the United States by age 50. I will journal around my big birthday to help put my life in perspective. Journaling is a very therapeutic self-reflection tool, and it can help you reevaluate your life while focusing on your accomplishments like your relationships, education, or work. A body-centered psychotherapist can also help uncover other root causes of your birthday depression. Meditation is also a helpful reflection tool to help avoid birthday depression. You can also avoid birthday depression by getting in some early morning exercise. Light exercise like yoga, walking, or a light cardio workout can reduce stress and depression. I know birthdays are usually synonymous with alcohol consumption, but this also may put you in a bad mood. I will likely avoid alcohol on my birthday. Other natural methods to reduce depression include avoiding caffeine and supplementing with vitamin D, omega-3 fatty acids, zinc, selenium, B vitamins, S-adenosyl methionine (SAMe), and 5-hydroxytryptophan (5-HTP). “Being Sad Makes You Age Faster, Say Scientists,” Newsmax.com, November 12, 2013; http://www.newsmax.com/Health/Health-News/depression-biological-aging-telomeres-psychological-distres/2013/11/12/id/536188/, last accessed March 30, 2015. Rankin, L., “11 Natural Treatments for Depression,” Care2 web site; http://www.care2.com/greenliving/11-natural-treatments-for-depression-an-mds-tips-for-skipping-the-prozac.html, last accessed March 24, 2015. “Aging changes in body shape,” MedlinePlus web site; http://www.nlm.nih.gov/medlineplus/ency/article/003998.htm, last accessed March 30, 2015.